Instead of just having a few big holes connecting it to the surface, it could have an ant hill 'room' that is pretty much just a ramp up to the surface with a small pyramid/cone shaped tower at the top. I used a program called "Techne" to create the models. Its a standalone program, nothing too fancy. It would spawn connected to the surface, but mostly be underground. Thanks. But someone SHOULD make this into a mod. This is a perfect thread, and perfect threads belong on r/minecraftsuggestions. They do not belong here. I have some suggestions, but it really depends on how complicated you will allow the colony structure to be. Is this supposed to be grand and complex or small and simple? Don't get me wrong, I would not make it worse than a village, but some of my ideas would make the system somewhat more complex. I will just proceed with my suggestions for improvements to your idea, and you can use them if you desire to do so. I am a serious ant person with a lot of knowledge on the subject of mymecology, but I will not go too deep for the sake of keeping the an dungeon idea simple. Firstly, you have mentioned that the ants would spawn in the colony in a manner similar to that of nether fortresses, but have you considered having the queen be the only means of reproduction for the colony? If the queen ant's chunk could remain loaded for the entirety of one's incursion, it could produce additional ants to rush the player from the inner chambers. To accomplish this, one would only need to use the standard AI already used for mobs. You have likely noticed that breaking the fence of a large pen of cattle causes the cattle to disperse out until they reach a stocking density they prefer. The ants could use the same mechanics. 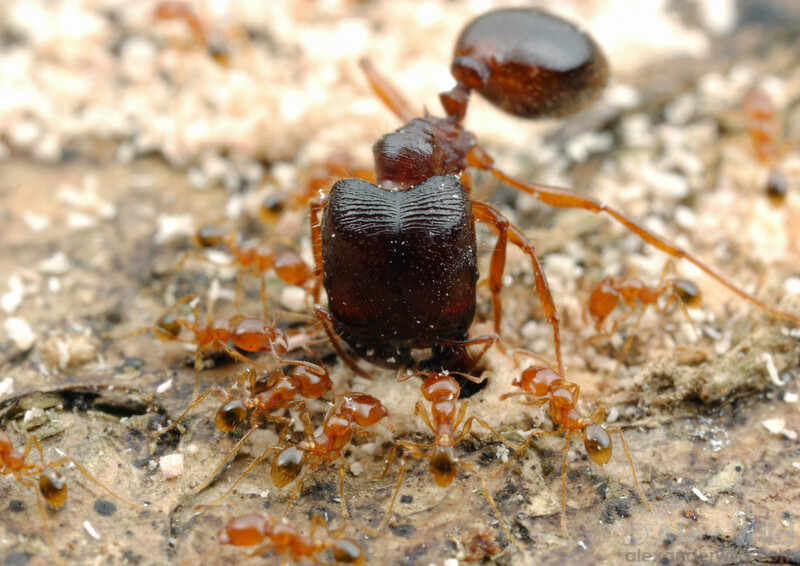 The queen produces additional ants, which then spread outwards until they are stopped by an inhibitor. I suggest you use sunlight, or rather a distaste for sunlight already found in real ants. This would allow the ants fill their nest to your desired stocking density, but they would not spill out into the overworld. The final component would be to give the queen standard mob spawner AI so that it stops producing when there are a certain number of colony members within its vicinity. Secondly, you seem to desire specific ratios of ants be found in specific rooms within the nest. This could be better accomplished by changing your designations for the caste and their appropriate behavioral mechanics. To begin, lets focus on the classes. The worker ants could benefit from an avoidance AI, which causes them to flee the player and other mobs if they are attacked, if the foreigner retaliates to their weak attacks, or even at the sight of foreign bodies if you desire. Like workers in a real colony, they would be seen as rushing away to protect their brood (eggs, larvae, pupae) and resources. Soldiers on the otherhand would rush towards the invader on sight and engage him/her with their main attacks. As the workers and soldiers follow their AI, you would end up with the frail workers falling to the center of the nest, the brood chambers, food stores, and garbage dumps as you desired, while the soldier stay in the outer chambers, that is the “resting chambers” and entrances. ----- Repletes have bloated gasters filled with food and act as larders for the ant colony. They seldom move, and should only occur in the deepest reaches of the nest hanging upside down from the ceiling. They should have passive AI with a preference for only the lowest light levels to ensure they do not stray from the central parts of the nest. When killed, they could drop nectar which can be consumed by the player or perhaps superior amounts of resin. ----- Suicide bombers (maybe call them formipetard as some find the name offensive) mix chemicals within their bodies to unleash a devastating blast of boiling chemicals onto whatever attacks the colony. 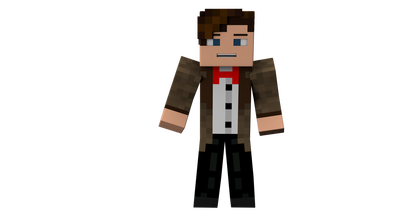 They would work like creepers, but to prevent them from destroying their own nests they should be unable to destroy resin, sand, sandstone, or hardened clay. Anything caught in the explosion would take a massive amount of damage. Perhaps they could drop gunpowder or a special material that can be used to make an acidic splash potion. ----- Formic Artillery could appear in the game with a ranged attack that would give the a small amount of damage with each shot. You stated you did not want to animate the ants shooting acid, but you could instead have a caste of ant permanently in firing position, indicating to the player which ants have the ability to perform their ranged attack. Like suicide bombers, they should drops ingredients for acid potions. By extruding venom from its abdomen, the queen ant could create a toxic cloud that harms the player (note that formic artillery and suicide bombers would not be given the aftereffect). This could be done with the new effect cloud potion to be introduced in update 1.9. Many ants slash their opponents with their stinger rather than jabbing them directly, leaving a large open wound and increasing the effect area of the burn. This attack could increase damage taken for a short period by introducing a re-purposed splash potion ants that does not effect ants. In some species, queen ants hunt above-ground while raising their first broods and thus are capable of restraining and killing prey. The queen, therefore can be given the ability to tightly squeeze the player, preventing him/her from moving while it quickly jabs the player with a weak sting. This would also allow other ants to deal damage until it releases its grip a few seconds later. That is all I have for now, and you can use them if you desire or ask me to elaborate further if you like any of my ideas. I like the idea, but I think this would work better as a mod than an addition to vanilla minecraft. But nice work on the detail, I was hooked and interested in the idea of an ant dungeon. But again, I'd rather it be a mod. Hey, if you guys don't like something, tell me! On this forum people are very finicky in terms of both presentation and appeal of a post. Just be happy people actually posted on you suggestion; many are not so lucky and are never told what is wrong, left in the dark on whether or not their idea is even interesting. Good-looking blocks, a potion effect that is interesting and useful, a challenging-sounding dungeon, and obvious hard thought put into many places. Wow, that's a lot to look at. I have school tomorrow, so I can't go in depth and look at the whole thin right this second, but I will read this. Hopefully I'll get back to you tomorrow. A lot to read means a lot to talk about, and a lot of time to process it. It's a solid idea, and Minecraft could use more flavor, especially for biomes with almost nothing like Deserts and Mesas. Ok, I got around to reading this whole thing through. I like a few of the Ideas, but I do favor simplicity to complexity. And if things are too specific, people will lose interest. You have to favor fun "half truths" over "whole truths" sometimes, unfortunately. I could rant about that for hours though, but not here. PM me if you want to talk about that though. But again, thanks for "throwing me a bone" if you will. So you study ants!? Great! I've been relying on wikipedia this whole time! Firstly, you have mentioned that the ants would spawn in the colony in a manner similar to that of nether fortresses, but have you considered having the queen be the only means of reproduction for the colony? I have, but then every time you defeat the ant queen, the entire colony dies. I want them to be similar to guardians and always be around. That's why I said the ant colony might be polygynous, or have multiple queens. Even if the queen dies, there might still be a queen somewhere that's making more ants. You could at least give it the benefit of the doubt. If the queen ant's chunk could remain loaded for the entirety of one's incursion, it could produce additional ants to rush the player from the inner chambers. To accomplish this, one would only need to use the standard AI already used for mobs. That would be good in some instances, but then there would be the re-occurring issue of population dispersion. I want more ant soldiers on one place, more workers in another. Ant the only way I've been able to kinda fix that problem is to make it be...aahhh, just read Ouatcheur's post about bounding boxes. On the sun avoidance suggestion, while feasible, just doesn't make sense to me. Yes, some small ants dislike sun, but large ants with extra thick chitin? They shouldn't be all that bothered with it. Ant I do kinda want them to disperse onto the ground above them, because every time I see an ant hill, there are a million ants around it. And I live in Colorado Springs, with 300 days of sunshine a year, and our ants are just as angry as always. Behavior mechanics are a bit tricky right now. Remember when mobs would run away from TNT, and that would lag everything? Now imagine the opposite effect with ants, always path finding to a room. This might be a good idea, but pathfinding is still a bit tricky currently, so .....I guess that will have to wait till Mojang finds a solution for lag-less pathfinding? As for passive worker ants, nah. Every time I would, uuhhh, "feed" a live spider to an ant hill (in hind sight, that was messed up), the workers would work on subduing the target, and the soldier would then kill it. I like how the workers would be neutral. It's kinda a balance of both. Next, lets discuss the ant classes themselves. Although you call them soldiers and workers, might I suggest you pick medians and minors instead respectively? Nah, While it is more technical, people are less likely to associate with it. "Worker ants" and "Soldier ants" are more easily recognizable to "the common folk" if you will. Majors are the classes of ants used by many species for combat or utility purposes noted by their large sizes, and in many, oversized heads. Including them could work well to better balance out the drops found within the nest by making them act as mini-bosses, taking strain off the queen. I like that idea. Another person suggested a Driver ant like thing, and sub-bosses that are under the mini-bosses (Queen) would be very challenging, and provide a more balanced way to get certain drops. Plus they would spruce up the diversity a bit. Maybe strength? That would be a bit similar to Fallout ant nectar though. This sounds interesting, but it's kinda too close to creepers. As for distinguishing the different ants, maybe the ranged ones could have green markings on their red bodies. And lately I've been thinking that more ants won't help. I still want to add one more ant, maybe two, but I can't have too many. Unfortunately, some ants have to be on the chopping block. It's special ability is making the players get stuck in resin blocks, swarmed by ants, and have ants around it get healed. I don't think it needs more abilities. It already does have a melee attack, it just retreats after getting hit. Go ahead! Creativity is expanding and re-purposing other peoples idea's and experiences. I had this idea by looking at an ant crawl up my wall after reading that one bee suggestion. But please, do get back to me on this! So, something that I think would be cool is if the soft, still sticky, resin blocks could have ants spawn in them, as if there were eggs that had gotten buried in the resin. Wikipedia in relation to pop culture is unreliable. Trolls leave the science stuff alone, because so few people use it. That's why I used Wikipedia as a research material. I'm glad to see you liked the ideas, and even though only one interested you, I'm still happy to have helped and shared some information of ants with you. I understand what you mean when you say you want to keep it simple or people will lose interest; "The Lag Factory" I'm visualizing would be way too complicated for Mojang to undertake in s timely manner. I'm a second year college student, so I know time restraints. The ants should be more imaginative than realistic because the world of minecraft is different from our own. 1. The bounding box idea does sound ideal for the different rooms in the nest, as one would not have to worry about a dozen of ant moving through the colony every time one places a torch. 2. I can think of several things a major could drop that would fit into the ant nest design. Perhaps it can drop a pheromone sack that can be crafted into an item that stops ants from attacking the player? Or a larger stinger that can be brewed into potion? It can even drop ant "meat" if you so desire. 3. The nectar from repletes would only be a standard food item with no special affects other than restoring hunger to allow one to press deeper into the nest. Around the world, repletes of honeypot ants are viewed as a staple food source and I hear they are quite delicious. 4. Suicide bombers within real ant nest show no concern for other ants in the vicinity if it help the colony as a whole protect the queen. Having the suicide bombers damage other ants was my attempt to keep this caste balanced. To continue with information on the suicide bombers as you requested, they would be produced within the nest only rarely and rush towards the player before detonating and dealing massive damage. They can either do a single-event damage like a creeper, inflict a status affect that drains health over time, release glue that prevents the player from moving momentarily, or grant an effect that increase damage taken from ant attacks. 5. Remember not to confuse caustic chemicals, formic acid, and venom if you intend to use all three. 6. I was confused on whether or not you were content with the queen ant or not because you had mentioned that you did not want it spawning other ants like any other mob queens would. Now that that is straightened out, the current AI sounds effective and I do imagine she would be most effective for combat support. I'm willing to give more information or suggestions if you desire to help your idea take off. I do not remember if you had found a way to animate the ants, but from what I have seen, it is pretty complicated. Still, I like the suggestion that you make this into a small a mod sometime in the future to showcase the idea, and better illustrate the concept to people. Or course, being a college student, you will be a bit short on time, so that may not be a viable option. I'll compile all the best/interesting/useful suggestions and prepare to re-suggest them. Hopefully if I'm not too busy, I should be able to update this thread in a month or so.